No job is too big or small when plumbing is all you do! Whether you have an annoying leaky tap, a toilet that won’t flush, a major problem with your hot water system, or need to install a bathroom in the basement, we’ve been providing high-quality, dependable plumbing services all around Calgary and the surrounding areas since 1999. That’s why we’re able to call ourselves ‘plumbing superheroes’ (see our superhero guarantee below). We provide complimentary, over the phone estimates to meet your plumbing needs. For larger projects, a Pete The Plumber technician will visit your property and diagnose the problem with you. Then we’ll apply our plumbing experience to recommend the most cost-effective and long-term solution; one that avoids future problems. Whether it involves repairing existing appliances or installing new equipment, your leak, drip, or other problem will be fixed with no fuss. We’ll help you create the problem-free, mess-free, safe home that you and your family want to live in. 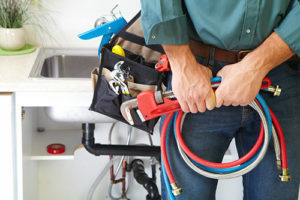 You wouldn’t use a Band-Aid on a gaping wound, the same is true with plumbing. Band-Aid solutions are inadequate and nearly always result in bigger problems down the track. Whatever your plumbing problem, get it done once and get it done properly. That way it won’t come back to bite you – and you won’t need to call somebody else in a few months. Waterprotec is an innovative water damage prevention system, designed and manufactured in Canada. It is an automated smart valve system that shuts off the main water supply as soon as a leak has been detected. Pete The Plumber offers Waterprotec supply and installation for only $920 + GST. Do you have faucets and toilets we can see? Yes we do, we have a working showroom of kitchen faucets, basin faucets, shower valves, shower heads, shower wands, toilets, and many more things to check out.